trapping processes and their acclimation state (Fig. 7.2A). 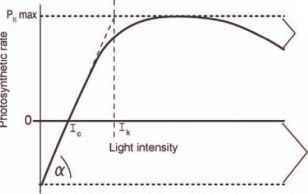 As light increases, however, the slope begins to decline to zero at which point the photosynthesis versus irradiance curve has reached a maximum value (referred to as PN max). 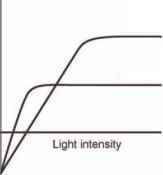 Further increases in light do not result in any further increases in photosynthetic production due to the saturation of the dark reactions of photosynthesis. That is, the capacity of these reactions to convert energy and carbon dioxide into organic carbon molecules has been exceeded. At very high light levels, PN may decline below PN max due to a detrimental process called photoinhibition. The latter occurs because high light levels cause the light reactions to over-produce trapped energy from light capture resulting in oxygen being converted into highly reduced molecules of 'active oxygen'. Oxygen receives the excitation energy (essentially becoming supercharged) and, if these resulting supercharged molecules of active oxygen are not neutralised by various antioxidant enzyme pathways, serious damage to cells and tissues can eventuate. This damage is an important step in 'coral bleaching' (see below). The characteristics of photosynthetic versus irradi-ance curves, while being driven by light, can change to some extent through the process of 'photosynthetic acclimation' (often mistakenly referred to as 'photoadaptation', which implies wrongly that evolutionary 'adaptation' is involved). To optimise light capture in low light while reducing the risk of photoinhibition, photosynthetic organisms actively manipulate the efficiency of light capture (a) by adding or subtracting chlorophyll and other pigments to or from the photo-synthetic components responsible for light capture. This ability to process captured light (that reduces the relative risk of photoinhibition) is high in organisms that grow in high light habitats, and low in organisms that grow in low light. Organisms can change their ability to process captured light by increasing the capacity of their dark reactions (Calvin-Benson cycle) to increase PN max. These changes define many of the differences between shade and light-acclimated photo-synthetic organisms (Fig. 7.2B). Over day-night cycles, the photosynthetic activity of reef communities fluctuates between periods of net consumption (i.e. at night, Fig. 7.2C) and periods of net production of organic molecules (i.e. during the day, Fig. 7.2C). On the way between these two extremes, pho-tosynthetic reef organisms pass through periods (usually a few hours after sunrise or before sunset) in which the fluxes of carbon dioxide, oxygen and energy are zero (Ic, as described above). As the sun rises, the rate of photosynthetic activity becomes positive, increasing toward maximum values in the middle of the day. At this point, PG approaches PG max that may be several times the absolute value of respiration. The daily photosynthesis to respiration ratio (P:R ratio) can be derived from the integrated photosynthetic activity over a day (PG 24 h) divided by the respiration that occurred over the same period (R 24 h) and is used by many physiological ecolo-gists to examine how dependent an organism is on energy derived directly from light. P:R ratios can be calculated for short (hourly) or long (daily, yearly) periods. Organisms that have P:R ratios that are greater than 1.0 are referred to as autotrophic ('self feeding'; also referred to as phototrophic or 'light feeding') while organisms that have ratios of less than 1.0 are referred to as hetero-trophic ('feeding on others'). Organisms on coral reefs have a wide range of P:R ratios. Photosynthesis to respiration ratios can be applied to communities as well, giving important insight into how much organic carbon or energy is entering a particular patch of land or seascape. In the latter case, these measurements are easily integrated into measurements of the net accumulation of organic carbon per unit time (primary production). These types of measurements provide an important basis from which to answer key questions such as whether coral reefs are a net sink or source CO2. Productivity varies across the globe, with some of the highest values being found in tropical rainforests (700-800 g C m-2 y"1. The highest values that occur in the ocean range from 200 to 500 g C m2 y 1 and are associated with nutrient rich coastal areas where up-welling occurs (e.g. off the west coasts of South America and Africa). The oceans in which coral reefs occur generally have low primary production rates of around 0.1-1.0 g C m2 y_1. Coral reefs, on the other hand, show average rates of primary production that range from 3-100 g C m2 y 1 (averaged over all components including sand and rocky substrata) with some components (e.g. algal turfs, macroalgae, symbiotic corals) having rates that match those of the highest productivities in terrestrial systems). There is no single value for the primary production of all coral reefs. 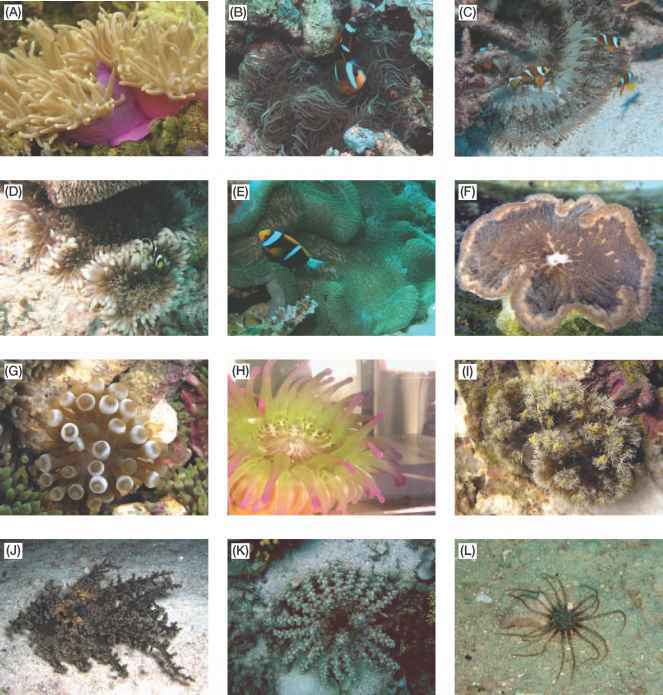 Primary productivity varies with such characteristics as whether a reef is inshore or offshore, or whether it is a high or low latitude coral reef (Fig. 7.3). Values for primary productivity also vary according to location within a reef. The well flushed conditions of the fore reef have the highest primary production values (up to 1500 g C m2 y_1) while the poorly flushed and more variable conditions (in terms of temperature and light) of back-reef areas can have very low primary production values (up to 300 g C m2 y_1). Primary productivity also varies with the component of reef ecosystem considered. Benthic microalgae (see Chapter 15) and corals (and other symbiotic invertebrates) can have primary productivities of up to 2000 g C m2 y1. inorganic nitrogen (usually as ammonium or nitrate ions) and phosphorus (as phosphate). They get these compounds from the breakdown (waste) products of animals that have consumed other organisms, or by the breakdown of debris generated by predators (e.g. fish) or scavengers (crabs, starfish) and use them to build new organic molecules. A range of organisms are involved in these natural cycles with different types of bacteria playing a dominant role in degradation. Huge populations of bacteria inhabit the sediments associated with coral reefs, which provide the ideal microenvironment for processing these compounds. One of the best known of these process pathways is the nitrogen cycle (Fig. 7.4), in which organic material settles on the surface of the sediments and is quickly buried by scavengers such as worms, molluscs and crustaceans. In the upper few millimetres of the sediment, where oxygen levels are relatively high, a diverse range of microorganisms (bacteria like Vibrio, as well as many actinomycetes and fungi) use proteinases to strip amine groups off proteins and release ammonium ions (a process called 'ammonification'). Some ammonium ions escape from the sediments into the water column for use by photosynthetic organisms to build amino acids and proteins. Some ammonium ions continue down a pathway of 'nitrification', in which case the ammonium is oxidised to produce nitrate. This occurs in the O2 rich upper sediment layers by a set of bacteria that must have oxygen to survive (Fig. 7.4). 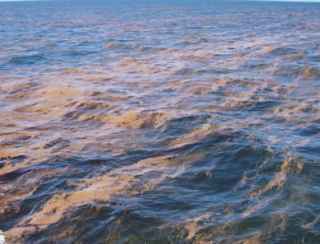 Some nitrate released by this process leaves the sediment also for use by marine photosynthesisers: some stays in the sediments and undergoes further denitrification. The next step involves the conversion of nitrate to nitrite that has to occur without oxygen and consequently occurs within the sediments, below the upper oxygen rich layers (first few millimetres). Here, oxygen levels decrease to zero due to the lack of light and the abundance of metabolising fauna that cause the oxygen concentration to decrease. The processes of ammonium oxidation and nitrate reduction are coupled. 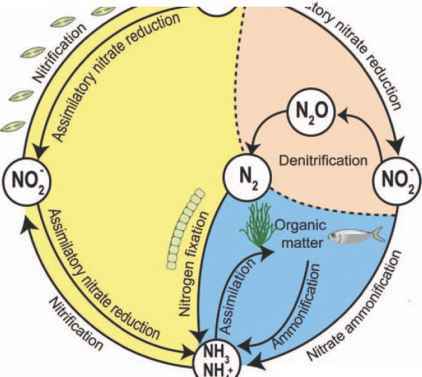 Aerobic nitrification sits adjacent to anaerobic denitrification (via the sediment gradient in oxygen availability), which is ideal for this coupling of the two processes together. The eventual outcome is that nitrate is reduced to nitrite, and nitrite is denitrified to nitrous oxide (NO) and/or nitrogen (N2) gas that is lost to the atmosphere. nitrogen comes from originally. 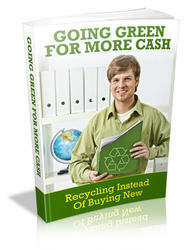 Cyanobacteria (so called 'blue-green algae') are important parts of the production line. One of their key characteristics is that they contain an enzyme called nitrogenase that can split the powerful triple bonds of atmospheric nitrogen gas (N2) in a process called 'nitrogen fixation'. Such nitrogen fixing bacteria occur in a large number of habitats and ecosystems, including microbial mats and symbioses such as with sponges and legume plants. Recent work has revealed that nitrogen fixation is prolific in coral reefs and may play a critical role in supplying nitrogen to coral reef ecosystems. It appears that nitrogen fixers are abundant on benthic surfaces (sediments, rocks) and in the water column of coral reefs as blooms of the cyanobacterium Trichodesmium (commonly called 'sea sawdust', Fig. 7.5). Coral reefs are an exception to the general rule that high primary productivity is strongly dependent on the availability of a high standing stock of inorganic nutrients (particularly N and P). Coral reef primary production is indeed high, yet the nutrient levels in the surrounding waters are exceeding low. What could be going on? To find the answer to this problem, we need to explore the ways that energy (contained in carbon compounds) and more particularly nutrients (N and P compounds) move through coral reef ecosystems after the initials stages of primary production.